A few years ago in Kyoto, my wife Tracy and I sat in a hotel room and watched a documentary about a Japanese man who had gone to Italy to learn to make violins. It has stuck with me all this time. I didn’t write his name down at the time, but I searched around, and I think it was Kōshi Kikuda (his website is here). I don’t remember many of the details of the story, but here is the basic sketch: Kikuda’s goal was not just to learn the basics of violin making–he wanted to make the best violins in the world. He thought to himself, Until now, the best violins were made by Antonio Stradivari–to be the best, it has to be better than a Stradivarius. This was his idea from the beginning. This was the bar he set for himself. That level of aspiration–that determination to go beyond–is critical to this story. But what makes Kikuda interesting is his next thought: In order to surpass Stradivari, I must completely immerse myself in his process. I must do what he did. So he moved to Italy, learned Italian, and set out to make a Stradivarius violin. He got Stradivari’s old journals and drawings. He found out exactly where Stradivari got his materials–this grove of trees for this resin, this grove for the wood for the neck, and so on–and he went to those places and gathered those materials. 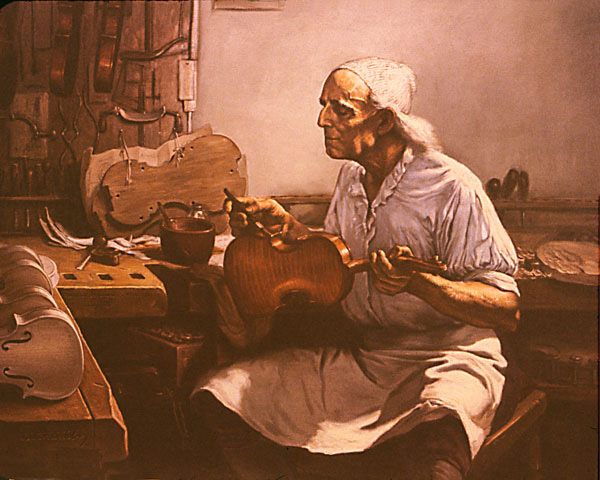 He used tools exactly like the ones Stradivari used, nothing modern. To the extent possible, he performed every step of the process precisely as Stradivari did. He did this for years and years. And today, Kikuda is considered one of the greatest violin makers in the world (and he occasionally wins contests which suggest that he might indeed be the very best). Sometimes, in speaking of lineage, we use the word intimacy. This is intimacy. In the documentary, he’s very humble about this, and very serious. To him, it seems like an obvious process–to be the best, you have to walk in the shoes of the standard bearer. It’s a clear and simple expression of what transcendence really entails. True transcendence doesn’t simply jettison whatever it went beyond–it includes it, then goes one step forward. At the time the documentary was filmed, Kikuda wasn’t ready to say that he had succeeded even in making a Stradivarius violin, much less surpassing one. But he had also reached a point in his work where that question no longer seemed to matter. I don’t know if he still makes violins in that strict way. I suspect his process has evolved, perhaps without him really noticing. His approach, to our modern way of doing things, is a radical one. After all, if you really want to know what makes a Stradivarius violin so special, we have technology for that. We can use computers and lasers and what-have-you to analyze it a thousand ways, to locate its technical strengths and weaknesses, and to improve on them. We can draw on research and researchers from multiple fields–not just hard science, but also psychology or anthropology. We can come up with infinite theories, not just of why those violins sound so good, but of why we think they sound so good. We have so many possibilities. I suspect that almost every test that can be conducted on a Stradivarius violin without destroying it has been done, probably multiple times. Yet here is Kōshi Kikuda, in his little shop in Italy, making the best violins in the world in a way that’s basically unchanged from 350 years ago. What are we to do with this? I don’t know about other Buddhist schools, but in the Zen world, it is not uncommon to hear that the student is supposed to surpass the teacher. In the West, I think some have taken that as a call to cultivate a wider set of skills than those who came before. There is an expectation, at least in the US, that a Zen priest will be a teacher, a therapist, an organizer of non-profits, a performer, a scholar, a family counselor, a childhood development expert, and maybe a yoga instructor. There is a feeling that to surpass one’s teacher, one must be something different from one’s teacher, one must carve out a new path on new ground. That intention to be all things to all people is a compassionate one, but how far can it go? Already, there is a pressure for a Zen priests to be an amateur at all these different things, but a professional in none of them. We fall into this without necessarily defining what it means–separate from all these new half-roles–to just be a priest in this particular tradition. Kikuda studied under various teachers along the way; it seems fairly clear that he has surpassed them all. But because of the depth of his experience, because he threw himself body and mind into the process in the way that he did, it is not an exaggeration to say that he also studied under Stradivari himself. He is the holder of that transmission. If you, like Kikuda, have the aspiration to understand Stradivari–if you are that rare person who wants to dive all the way to the bottom–then the person you need to talk to is Kikuda himself. He is that particular grove of trees. Who else is there? Dogen (the founder of the Soto school) was not a perfect person, I’m sure. And there’s much that he could not possibly have understood about the world we live in today, the context in which we try to keep this practice alive. But he is a standard bearer, and for good reason. We take as a given, from his writings and from what he built in his lifetime, that he was extraordinary, an exemplum of how to express the Dharma moment to moment. In the Soto Zen world, he’s both Stradivari (the maker) and Stradivarius (the product). If we want to surpass Dogen (a good starting goal, I think), how do we go about doing that? How do we study directly under Dogen? How do we immerse ourselves in that experience? Where do we find that particular grove of trees? What do we leave behind so that others might find the way? This entry was posted in Uncategorized and tagged buddhism, Koshi Kikuda, koun franz, lineage, stradivari, stradivarius, transmission, zen. Your recurring reference to the grove of trees reminds me that it’s my life that supplies the raw material for making something beautiful, in this case, a violin. I don’t really have to travel anywhere else to find the materials I need, and yet this is the last place I want to look. Your question at the end about how we can become an instrument for others is a good one. Thanks. In the act of being the maker and the product/instrument; I think we are also the player(s) and the audience. But, how do all the pieces compose a relational field, outside of these 4 dimensions? I don’t know if I have a good response, but your question brings to mind the “Three Wheels”: giver, receiver, and gift. For one to exist, all three must exist; the action of one is what actualizes the other two, and simultaneously. It seems like a different way of describing the same thing. Dogen says Shakyamuni received Dharma from Kashyapa Buddha and Kashyapa received Dharma from Shakyamuni. Buddhas are not lined up nor are they gathered together, they just inherit from each other. This, according to Dogen, is the true Dharma heritage of all Buddhas and all ancestors. So this lay person would say; I enjoy your posts very much. Picked up, they are transparent and clear. Released, they scatter in all times and directions. What you mention here about inheritance is my all-time favorite statement on transmission; it’s also, I think, true. Thank you. It’s always a pleasure to run into you, wherever I do.